OK this mouse pad may look like metal but it is not. 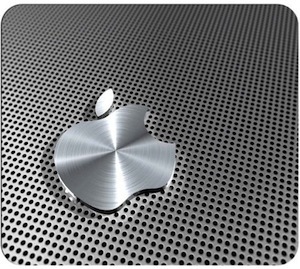 This mouse pad looks like a sheet of aluminium with little holes in it and a brushed metal Apple logo on top. It looks stunning and would be a perfect item for an Apple fan boy and I would love to have one on my desk but I use a trackpad so no need for a mousepad even if it looks as stunning as this one. The mousepad cloth top on witch this picture is printed and a non slip back so that you can use it without moving. Come have a closer look at this Aluminium Apple Logo Mouse Pad.